Over two months after receiving FansProject's Insecticon Shrapnel homage figure, Thundershred, their Bombshell tribute, Stormbomb, arrives at the Hive! And just days after receiving him, Big Bad Toy Store sent me an e-mail Monday notifing me that the third figure, Backfiery (aka Kickback) is now in-stock. That grasshopper should be here later this week, but in the meantime let's give Stormbomb the spotlight and see how he turned out and how he stacks up against his fellow Insecticon. Stormbomb is a tribute to the G1 Insecticon Bombshell, but delivers an all-new sculpt that fits in seemlessly with the updated "Classics" TransFormers figures. His face sculpt also captured Bombshell's visage very well. He reminds me of the Shredder from Teenage Mutant Ninja Turtles with his vented mouth guard. He's a fraction taller than Thundershred, but features a completely different sculpt, as he should. In fact, the only parts I believe are reused are his hands. Stormbomb's robot mode is a much better representation of Bombshell's animation model than Thundershred is of Shrapnel's because his proportions are more humanoid than 'shred's. Of course, that does come at a price. Stormbomb has several sections that "float" over joints and move around a lot while your handling the figure. The positive is that these floating panels allow for better movement because they don't restrict the joints as much as solid pieces would. These sections are found on the shoulders and the three-paneled waist armor. Stormbomb's (just like Bombshell's) alternate mode is that of a robotic rhinoceros beetle. The floating waist panels are necessary to facilitate the transformation process on Stormbomb. The overall procedure of converting him to his beetle mode isn't very complicated and like most newer TransFormers is about properly aligning one section before moving on to the next. You start by raising the waist armor up against the upper torso. The heel and toes on each foot fold down against each other. The thighs telescope into the lower legs, which then rotate outward, bringing the tucked up rear insect legs towards the robot mode's back. Similar to Thundershred's transformation, there's a piece on the robot's back that fits over the head, concealing it in bug mode. This also raises an articulated arm on which the rhinoceros horn is connected. The only somewhat frustrating part of his transformation is the placement of the robot arms. First you have to rotate the shoulder armor outwards, then the shoulder joints fit into his back with the arms plugging into the beetle's underside. You have to make sure the joints are rotated the correct way to allow the arms to lie flat against the body. It can be a little tricky because of the amount of articulated points in the arms. The final steps are extending the insect legs and plugging his sickles into the forward leg joints, forming the front legs. 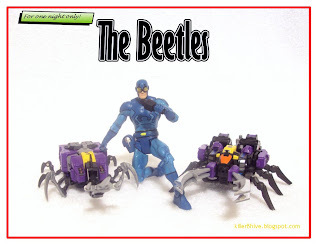 Once completed, you have a another robotic beetle to go with Thundershred. Stormbomb seems less vehicular than Thundershred, who seemed more tank-like to me than insect-like. 'Bomb has a lot less gaps than 'shred and I think that makes his rhino beetle mode a bit more effective. The complaint I have with this mode is the length of his legs. They're just too short to get him to stand on the tips of each leg as a beetle would. Although the front legs end up being much longer, the angle they're connected to the upper legs in don't allow the tips to touch the ground either. Stormbomb's choice of weaponry follows the ninja theme FansProject established with Thundershred. The two sickles, or kama, that form the beetle mode's front arms can stay mounted on the base arms while Stormbomb's in robot mode or removed to use as handheld weapons. The rhinoceros horn, which forms a trident, can detach and split into two bladed weapons that also fit into Stormbomb's hands. 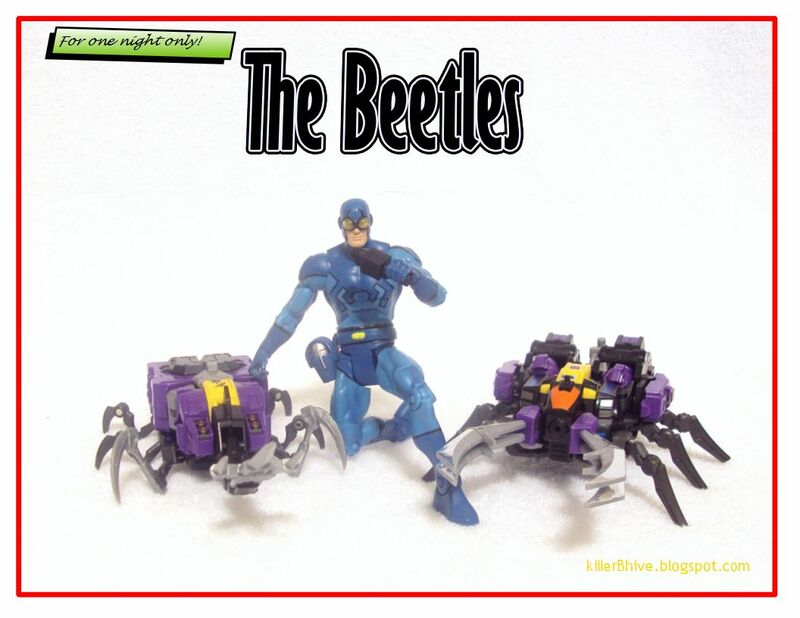 These four pieces are essential while in beetle mode, but interchangeable while in robot mode. The fifth accessory is a weighted chain that can attach to any of the bladed weapons for a truly fearsome armament. When combined with the sickle the chain forms a kusarigama. You can attach weapons on each end of the chain for some truly deadly combinations. While it's an awesome weapon, the downside to the chain is that there is no place to store it on the beetle mode. 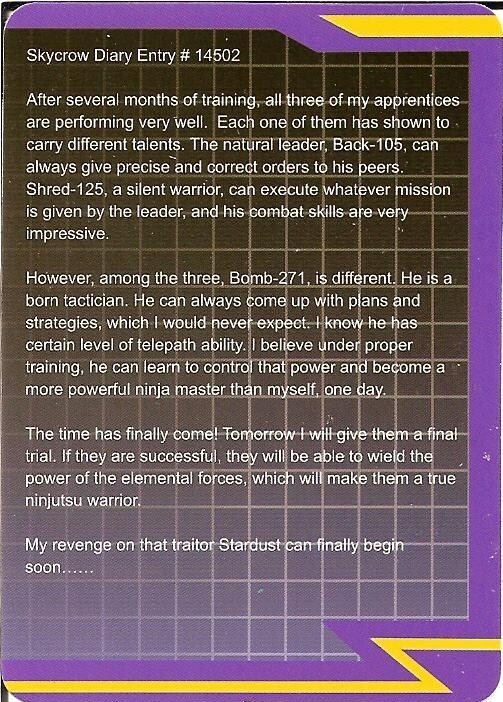 All in all, Stormbomb includes a fearsome arsenal of ninja-inspired weaponry. There were some fans who had trouble with Thundershred's blades breaking their tabs, so FansProject threw in a spare set with each Stormbomb figure. 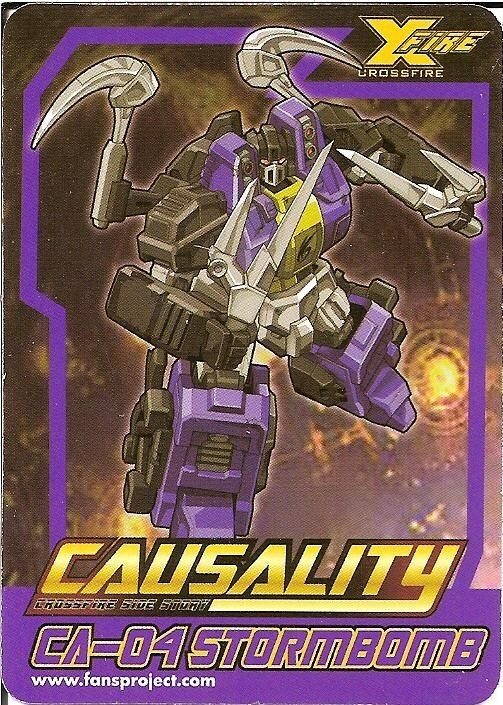 The weapons are identical to those included with the first Causality release and FP even added an extra blade handle. I haven't had any problems with my original set, but it's nice to have a spare and it was really cool that FansProject did that. And a Repro Labels upgrade.